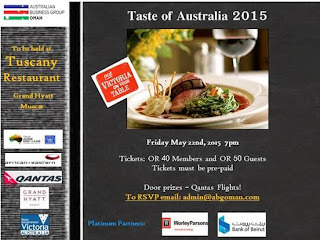 I was a little disappointed to learn that the Taste of Australia dinner that is coming up on Friday 22nd May at the Tuscany restaurant in the Grand Hyatt is not going to feature shrimps on the barbie, but apparently it's a much finer fare than that (as reliably informed to me by an actual Australian). If you're keen for some posh dinnies, then RO 50 (or RO 40 if you are an Australian Business Group member) gets you a ticket to the party. Qantas Airways have kindly donated 2 flights as a door prize too. If you want to go, you can email admin@abgoman.com for tickets. Now, did the long weekend start yet?